From constables to superintendents, Sri Lanka Police officers participate with enthusiasm in Kataragama's time-honoured traditions—such as kavadi. Just mention the word "Kataragama" to any Sri Lankan and it conjures up images of torch lit processions, inscrutable holy men and stories of the miraculous to many. To others, however, the word is synonymous with flim-flam, hocus-pocus and hanky-panky. But what about images of barefoot police officers covered with holy ash, dancing furiously to the beat of kavadi music? Hard to imagine? And yet the seldom seen spectacle of 'police kavadi' is only one of many ways in which hundreds of men and women of Sri Lanka's law enforcement agencies are involved in the protection and promotion of Sri Lanka's colorful multi-religious traditions. More than 500 of them are specially assigned to Kataragama alone to provide security and related services to the uncounted thousands of Buddhist, Hindu, Muslim and other faithful who flock to the annual 16-day July festival. Perhaps no other public servants of Sri Lanka are more keenly aware of the dual character of their service than those posted in Kataragama, the once-sleepy jungle shrine in the remote south that commands such a reputation among rural and urban Sri Lankans alike. They soon come to know that a much older and still mysteriously powerful Kataragama exists even today alongside of the modern town that has grown up around the sacred precincts. Necessarily, experienced civil officials in Kataragama feel obliged to acknowledge that affairs on both sides of the Menik Ganga are ultimately in the hands of a higher power or intelligence that still operates quietly and unobtrusively even as it accommodates itself to the passing procession of humanity that we call 'history'. Many find that the humbling realization also fortifies them in the conduct of duty.  For centuries the enforcement of justice in Kataragama was left to the mysterious spirit of the locality Whose invisible kingdom was widely felt to extend far beyond Deviyange Kæle or 'God's Own Forest'. Pious Muslims, Buddhists and Hindus alike all once shuddered at the merest mention of Kataragama, and no knowledgeable person would have dared to invite divine retribution through reckless behavior in the sacred setting. The spirit is still there; only perceptions of it have altered. Cooled down: Sergeant Silva after Police Kavadi. It was not until the 1950's with the coming of motor vehicles to Kataragama that the need was felt for a police station to insure the shrine's security year-round. With them the police brought to Kataragama a code of statutes that is still growing to keep pace with the growth of social crimes in the modern era. Nothing can turn back the clock now. In the course of time, law enforcement officials have earned their niche in Kataragama through protecting and serving the poor common people who are drawn there as well as the rich and influential of society. And despite the anxieties of many, today even as in days of yore, justice is still meted out in Kataragama even when it is not readily recognizable as such. This may come as a surprise to readers acquainted with the mischievous associations of al-Khidr, Katirkama Murugan, Kataragama Deviyo or whatever one chooses to call the roguish yet divine spirit. The list of alleged activities—theft, vandalism, kidnapping, false representation, murder, indecent behavior and so on—would fill a book. An early ever-youthful offender from classical North India, Skanda 'the Leaper' is called a dhurta or 'rogue' in the Atharva Veda, an ancient canonical text. The suspect is rumored to have 'jumped' from India long ago to Lanka; Kataragama today is his principal hideout. In the course of my own special investigative work in Kataragama, I have had ample opportunity to see the Sri Lanka Police at work and at worship, and even to know them on a friend-to-friend basis. They all seem to have a healthy respect for the 'Unseen Hand' of Kataragama. As a researcher, I marvel at the key role played by police in the elaborately-choreographed 16-day ritual performance, from crowd surveillance and security to such simple devotional service as sprinkling water over the nightly procession's path. An honor guard of police walks in simple spearhead formation at the head of the perahera, while others envelope the flanks and rear to mediate between spectators and spectacle. The ritual climax, however, comes only with the water-cutting ceremony on the morning of the festival's last day when the excitement for many is such that police have to use energetic means to keep frenzied spectators from getting into the path of this 'running perahera' with its untethered elephants. Once the water is cut in the privacy of a primitive pandal shelter built on water's edge, the crowds surge forward to seize a piece of the pandal and to romp and splash in the mystically - empowered teertham water. Police also take part in the high-spirited water-play. With the festival officially over and their special mission finally accomplished, a large party of police kavadi dancers assembles by the river. 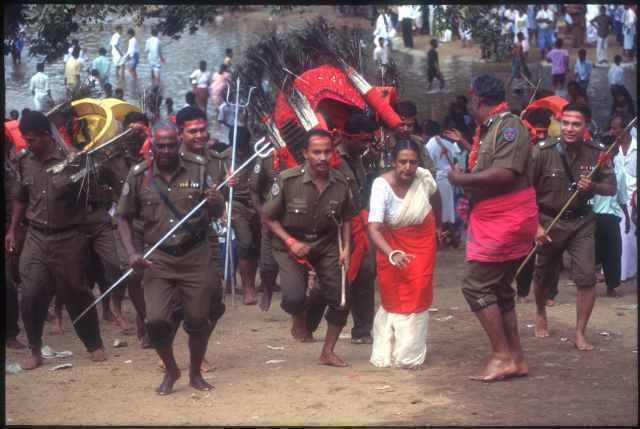 Nearly sixty police in uniform and in plain-clothes took part this year (1991); many by doing so were fulfilling vows made to God Kataragama. The dancing is fast and exhilarating. Superintendents dance alongside of constables and all are likely to get covered with holy ash being flung into the air. The terrific din and commotion reaches a crescendo in front of the Mahadevale when elsewhere there is only quiet. Peacock feathers tremble to the beat while vel-lances glimmer in the sun. Chief Inspector K.D. 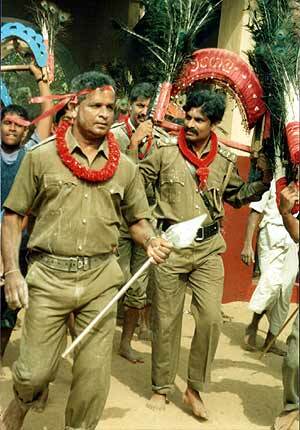 Somapala (foreground) and other senior police officials dance kavadi barefoot after the water-cutting ceremony. The police kavadi party proceeds dancing to the shrines of the god's two spouses Devasena and Valli before returning to the kavadi guru's makeshift shrine by the Menik Ganga for more splashing to cool the frenzy. Exhausted but wearing broad smiles, they splash curious onlookers and get splashed back in return to the general amusement of all. The next day I met Chief Inspector K.D. Somapala at his office. Now in fresh uniform, he is relaxed and businesslike as he fields my questions even as he is deciding on other cases being brought before him one after the other. A dedicated professional law officer and confirmed devotee of Kataragama at the same time, Chief Inspector Somapala is in many respects typical of the men and women who serve under him. He recalls being brought to Kataragama by his parents at age six when fever was a constant menace to pilgrims. But, he feels, pilgrims in those days also had greater faith. 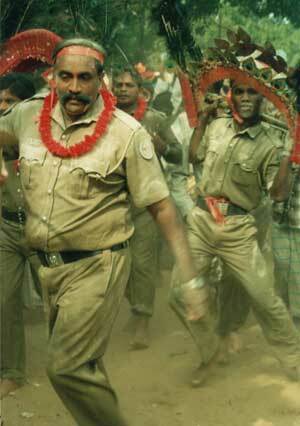 Later as a young police officer he served for years at remote posts in Vavuniya and Polonnaruwa districts. Thanks to Kataragama's protecting hand, he says, he never once caught fever. Now with eleven years of police experience including four years as Officer-in-Charge of Kataragama Police, Inspector Somapala feels convinced that there is an unseen divine presence at work there. And though he still feels personally responsible for maintaining public order and safety in Kataragama, he also feels than the sacred area's unseen spirit is still its final arbiter and peace-maker as well as its uncontested chief mischief maker. "One evening during the JVP insurgency of 1989 a report came to me that the Maha Kapurala's house was being robbed. I took a police sergeant and two constables and off we went by jeep." "Along the way we were ambushed by terrorists. But what happened? The hand bomb they threw struck a mango tree and bounced back, while all the bullets they fired only broke a side mirror of the jeep. Later we captured them and recovered the loot." "I have escaped from harm so many times, all thanks to god Kataragama", he confesses. "Land mines, bullets, hand bombs. And not only myself. During the whole JVP trouble not one of my men was killed or even injured by terrorist activity." Over the years, police officers assigned to Kataragama have learned to accept a low profile and to show the same humility and respect as other pilgrims, taking care to remove their footwear, for instance, before walking in the perahera or entering a temple compound. While disturbing incidents have not been entirely lacking, the enlightened policy of officers like Chief Inspector Somapala has insured that patience, restraint and understanding take the place of unreasonable brutality. At last year's festival there were still a few instances of pilgrim-suspects receiving harsh treatment from police within the sacred area. This year by contrast I neither saw nor heard of any such incidents. Thus, despite the dire predictions of pessimists, it seems that neither the big influx of people and wealth nor the resulting dramatic social changes have really threatened or undermined the sanctity and power of Kataragama. Perhaps even more police should be brought in for the special training available there during festival time for dissemination throughout Sri Lanka. In short, the paradox and mystery of Kataragama still lives on.